"I think the worst part of all of this is that I can’t eat and I’ve been hungry since I woke up around 7ish. It’s going to be a long day. Oh well. " About an hour after he wrote this, I walked into the eating area and there he was with a big bowl of Cheerios in front of him. As I walked by, it didn't register that he was EATING! Then it clicked. Stopping him immediately, he said he was so hungry, he forgot about NO FOOD AFTER MIDNIGHT. He had only taken one bite, but I feared it was one bite too many. I called the anesthesia people in disbelief. There I sat on hold, waiting to see if we could go ahead with a tablespoon of Cheerios and milk in his stomach. I slumped inside, outside and on many emotional levels when she returned with the news, "No, we are sorry." PAY ATTENTION! Lucas knew he couldn't eat, but lost focus and went on autopilot. I am completely depleted right now. Taking Lucas, we are heading into fourth grade to work and take our minds off the disappointments. He keeps asking if we can spend Thanksgiving in Arizona. Something tells me he was looking forward to seeing Jenny at Camp Del Corazon next week. I must ask Aunt Debbie and Uncle Matt if we can visit in November (and, how about today? I could really use an umbrella drink in their awesome pool right now). 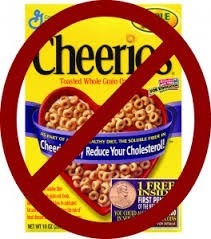 Who knew that one bite of Cheerios could cause such frustration and heartache?